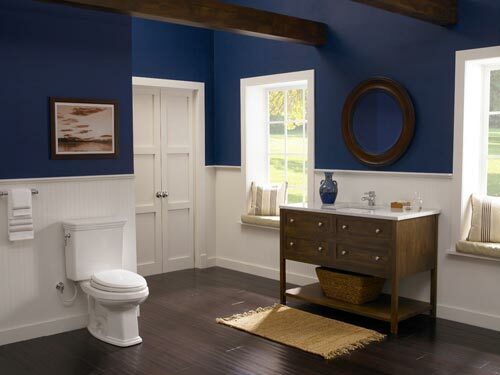 The toilet is the most functional element of the bathroom and yet it can also be beautiful. On the other hand a regular toilet consumes a lot of water, just by flushing. In fact, 30 % of your water bill is due to the water flushed down the toilet! The average toilet today is a 1.6 gpf (gallons per flush). Would you like a comfort height or a standard height toilet? The comfort height was only used for commercial applications in the past, but with all the knee, hip, back, etc. problems of the elderly, more and more clients are choosing the comfort height for the home. Once you have a comfort height toilet you will never want to go back to standard height. Another toilet feature that is common in other countries and is starting to be available in the U.S. is the dual flush. These toilets have 2 buttons on the top, one is generally for a 1.6 gpf (or even some are 1.28 gpf), and the other is to flush .08 gpf. The smaller volume is for water waste, and the larger volume for solid waste. The water savings is huge and it adds up. A standard family of 4 could save up to 29,682 gallons (113,117 liters) every year. That is a lot of water! So the next time you are in need of a new toilet, consider the dual flush. They may be a little more expensive upfront but the water savings are huge in the long run. We have one in our office if you would like to check it out! A bidet, which is commonly used in Europe, is another item many people love. Just because your home doesn´t have a bidet in it now does not mean you cannot enjoy the benefits of one. You can have a bidet seat installed on a toilet. They work very well and have come a long way. Some have seat warmers, automatic flushing, and are self-cleaning! So, don´t think that a bidet is complicated to have, even if you have space constraints.